Have you ever had a visitor to your home say they could smell your litter box? I have, and it completely changed how I think about litter box odors. This post is sponsored by ARM & HAMMER™ and the BlogPaws® Pet Influencer Network™. 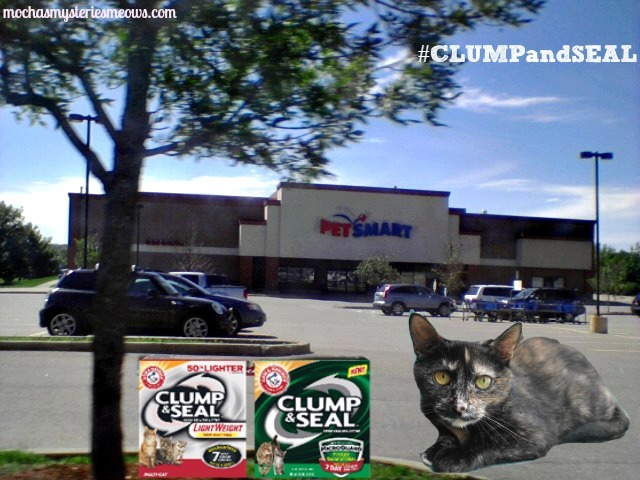 I am being compensated for helping spread the word about ARM & HAMMER CLUMP & SEAL™ available at PetSmart®, but Mochas, Mysteries and Meows only shares information we feel is relevant to our readers. Arm & Hammer and PetSmart are not responsible for the content of this article. Ever since that day I've been obsessive about making sure my cat's litter pan is immaculate, starting with choosing a top-rated cat litter that guarantees an odor-free home. ARM & HAMMER™ CLUMP & SEAL™ odor sealing litter is the biggest advancement in cat litter history. No other litter forms a tight seal around odor and destroys it with unique odor eliminators and baking soda. Many cat moms don't realize that even after you scoop bacterial odor can keep growing. The innovative, new MicroGuard technology seals and destroys immediate odor, plus prevents the growth of future bacterial odor for 7-day odor control, guaranteed. Arm & Hammer is on social media: Follow them on Facebook and Instagram today! Plus, visit their website for a $2 coupon! 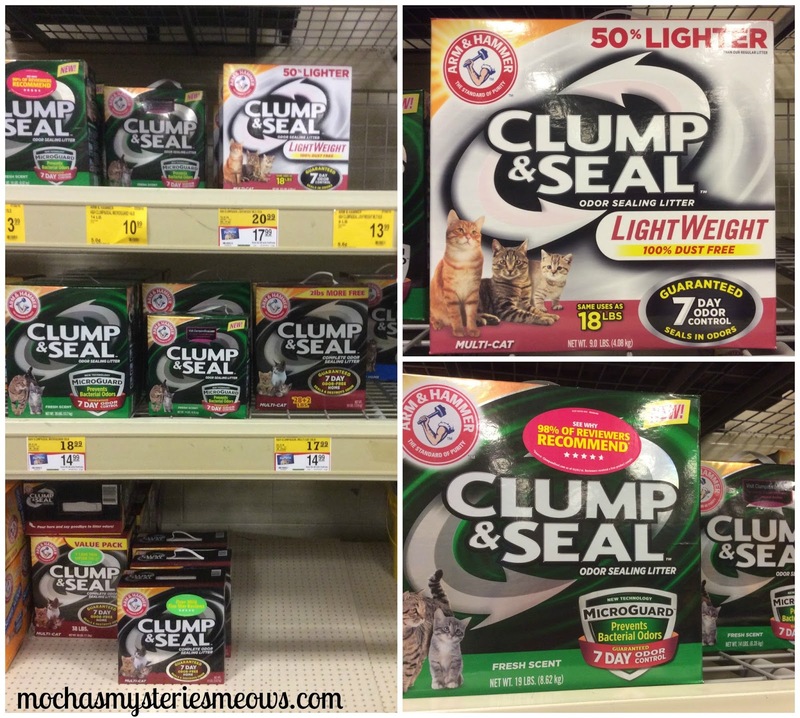 Have you had a chance to try ARM & HAMMER CLUMP & SEAL cat litter yet? My human can't smell a darn thing! She is always worrying about what guests are smelling when they show up. For years, I used regular A&H clumping litter and the clumps were never solid enough. I switched brands to one that clumps better, but tracks 100 times worse ... it seems like an endless battle to find a compromise. Perhaps this is the answer?!? That sounds like good litter! 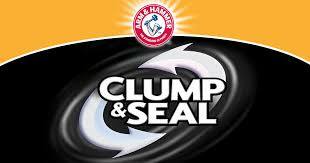 We've tried the Arm and Hammer and like it a lot. Our litter boxes vent to the outside so that helps prevent odor too. Well, this sure sounds promising! There are days that, no matter how fastidious I am with litter box cleaning, I can walk into my house and just smell it. If I can smell it, then surely my visitors can, the poor souls. Thank you so much for sharing this promising litter with us, Mudpie and Melissa! We use Fullers Earth Clumping Cat Litter and find it great. This is a UK Clumping one and it is great when you can scoop and don't end up with any "smells"! We don't like litter box odors either. Us kitties are pretty sensitive to them...more so than humans. This sounds great! We are a multicat household, and litter box odor is an issue sometimes. I especially like the idea of lightweight, dust-free litter. Thanks for the review! Sounds like a great litter. Mom Paula knows when she can smell the litter box that something needs to change. We haven't tried this litter yet, but are interested to see if we like it. There are waay too many of us so we use chicken feed for litter - works just like the corn litter.